Consumers and businesses can now protect sensitive information when sending financial or other private messages through e-mail, protecting users from prying eyes and theft. Firetrust Limited, provider of award-winning anti-spam and e-mail security solutions, today introduced Firetrust Encrypt 1.0, a powerful encryption software that allows consumers and businesses to protect sensitive information, such as financial, medical or other personal information, when sending e-mail. A key benefit of Encrypt 1.0 is that the email recipient does not need to install any software or change any configurations to their computer in order to open, decrypt and read the email and/or document. As long as the recipient has a Web browser – Internet Explorer or Netscape – they are able to access the encrypted information regardless of their e-mail program, firewall or operating system. Keeping e-mail transmissions safe is particularly important for those working in government, healthcare, financial institutions, or any other businesses that send personally identifiable information. The danger comes when an unsuspecting sender sends an e-mail that is intercepted by someone using a packet sniffer, which allows a person to “sniff” out information within the e-mail, and then steals or exploits the information. And by the time the sender finds out, it’s usually too late and the damage is done. Packet sniffers allow a person to reconstruct the SMTP and POP3 e-mail traffic in order to intercept and read the sender’s e-mail without the sender knowing. Most consumers or small businesses are either unaware of the potential danger or they simply haven’t taken measures to protect themselves. (D) simply click the “Encrypt” button, which encrypts the information using the U.S. government-approved 256-bit AES (Advanced Encryption Standard) encryption standard. It can only be decrypted and opened by using the password set by the user/sender. User sends encrypted e-mail, via an HTML attachment, to recipient. E-mail recipient receives e-mail and is directed to open the encrypted document in their Web browser. The recipient then enters the special password, at which point their browser retrieves the decryption algorithm, decrypts the file and places it on their desktop, ready for viewing. Also, the recipient requires no special software, just a Web browser and the password, which can be a one-time use password, or a set password for ongoing communications between sender and recipient. Security & Peace of Mind: Send secure e-mails with 256-bit AES encryption standard, and have the assurance that only the intended recipient will access and read it. Web-based: Because the decryption process is Web-based, the recipient doesn’t need to hassle with installing any special software to decrypt and read. Versatility & Works with Multiple Platforms: Works with all major e-mail clients, firewalls, and is compatible with Windows, Mac and Linux for those receiving encrypted e-mail messages. Firetrust Encrypt 1.0 is now available for download directly from the Firetrust website at www.firetrust.com. Firetrust Encrypt has a suggested retail price of U.S. $29.95, with a free 30-day trial. Firetrust Encrypt’s minimum system requirements include Microsoft® Windows® 98, NT, 2000 and XP; however, these requirements are only for the sender, recipients only need a Web browser and it doesn’t matter which operating system a recipient uses. It is compatible with Microsoft Exchange, Microsoft Outlook™ and Outlook Express, Lotus Notes and other major e-mail systems, and works with firewalls. It requires the following Web browsers: Internet Explorer 5.01 or higher or Netscape 4.08 or higher. In addition, .NET support** is also required. For users’ who do not have Windows XP, they can download the .NET Framework version 1.1 for free by going to www.microsoft.com/downloads and clicking on the “.NET Framework Version 1.1 Redistributable Package” link. Established in 2000, Firetrust provides world-class e-mail security products for business and home users. Firetrust delivers solutions across the spectrum of inbox protection, including MailWasher® Pro for unsolicited commercial e-mail (spam) and Benign® to neutralize harmful e-mail which can contain viruses, worms, scripts and Web bugs. The company is privately held and headquartered in Christchurch, New Zealand. 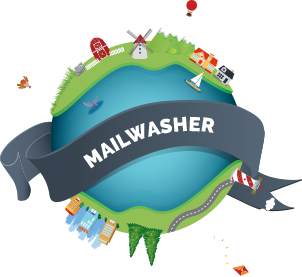 To date MailWasher has had more than 4 million downloads. For more information, please visit www.firetrust.com. **The .NET Framework version 1.1 redistributable package includes everything needed to run applications developed using the .NET Framework.